The Flatiron Building and 23 Skidoo! One vast horror, facing Madison Square, is distinctly responsible for a new form of hurricane, which meets unsuspecting pedestrians as they reach the corner, causing them extreme discomfort. I suppose the wind is in some way intercepted by the towering height of the building, and forced down with fury into an unaccustomed channel. When its effects first became noticeable, a little rude crowd of loafers and street arabs used to congregate upon the curb to jeer at and gloat over the distress of ladies whose skirts were blown into their eyes as they rounded the treacherous corner. Hanging about this particular spot soon became a recognised and punishable offence, and any one loitering there more than a few moments is now promptly “moved on” by the police. A lawsuit is also at this moment pending against the owner of this building, brought by a neighbouring tradesman whose shop-window has twice been blown in by the newly created whirlwind. This video from October 1903 shows how strong the winds were! 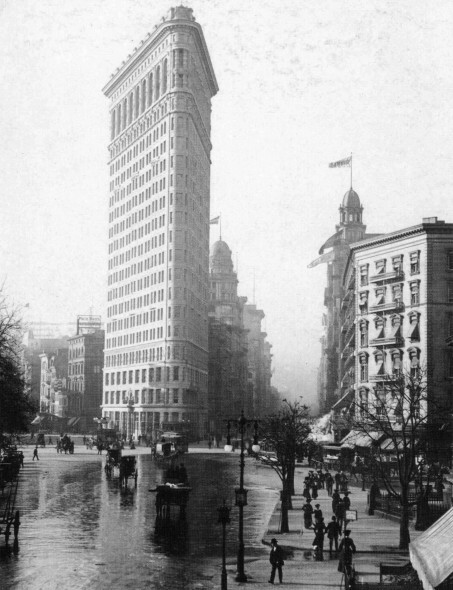 2 Comments on The Flatiron Building and 23 Skidoo! Fascinating! And such an amusing video as well. I loved the looks on the faces of the people when they looked at the camera. Almost a new thing, those motion picture cameras in 1903.